of grief where prophets gather to feed. of order, sowing wishbones along the path. feather-bones, pare the blood beneath my nails. giving way to vagrant lovers. Ronda Broatch is the author of Shedding Our Skins (Finishing Line Press, 2008) and Some Other Eden (2005). Nominated seven times for the Pushcart Prize, Ronda is the recipient of an Artist Trust GAP Grant, and a May Swenson Poetry Award finalist. Moon Path Press will publish her next collection in 2015. Her poems can be found in print and online, in Mid-American Review, Redivider, Superstition Review, Prairie Schooner, and Rhino Poetry, and anthologized in Fire On Her Tongue: An Anthology of Contemporary Women’s Poetry (Two Sylvias Press). 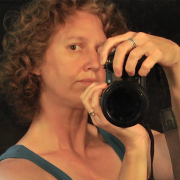 Currently, she edits the literary journal Crab Creek Review, and spends much time behind the lens of her cameras.